A man carrying his bike was struck and killed on train tracks Wednesday, May 2, 2018 in Ayer. The train was stopped in Ayer for the rest of the day while the investigation proceeded. The man was struck by an incoming train, while Transit police state he was trespassing. He was transported to Nashoba Valley Medical Center where he was later died from his injuries. All trains travelling through Ayer were cancelled until further notice. Crime scene tape was seen on the tracks pulled from one side to the other. Although foul play is not suspected, a full and thorough investigation is still active and ongoing. Further details have not yet been made available to the public. An additional amount of care is expected from drivers or conductors of public transportation, including trains. 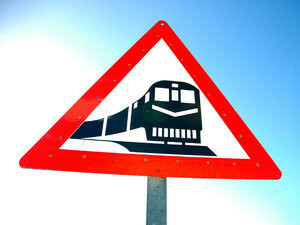 The train company would be responsible for injuries caused while on the train, if they can be proved to have been negligent in their actions, or the conductor can be proven negligent. Many train companies, as well as any commercial company, find it difficult to accept the fact that they have been negligent. After a railroad accident, you need to make sure your legal rights are protected. Hiring an attorney experienced in train accidents, who is able to navigate the complex legal system, and the specific and regulations pertinent to the railroad industry. If you or a loved one have been injured, or killed, in any kind of train accident, be sure to hire the right attorney. Having an expert attorney with the knowledge and experience to handle the legal complex system for you is mandatory. When building a strong legal case, it will make all the difference. The Law Offices of Jeffrey S. Glassman, LLC, understands what is needed and how to deal with issues that arise from accidents and insurance companies. Contact the Law Offices of Jeffrey S. Glassman, LLC at (617) 367-2900 to find out how we can help you.